Frequency Ranges from 20 MHz to 2500 MHz in Power Levels up to 100 Watts CW. Frequency Range is from 200 MHz to 6.0 GHz in power levels up to 200 Watts CW. Frequency Range is from 30 MHz to 6.0 GHz in power levels up to 1000 Watts CW. Two ports at 50 Ohms and the other two ports at 25 Ohms. Available in 1000-2500 MHz frequency range. Combines two signals up to 300 Watts CW of total output power. power levels up to 500 Watts. in power levels up to 100 Watts CW. 6.0 GHz in power levels up to 200 Watts CW. in power levels up to 2000 Watts. IPP can design and manufacture custom power products to suit your individual needs. 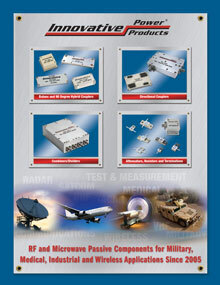 Contact Us with your specifications and ask about our Custom Products, including Resistors and Terminations. An IPP representative will contact you to discuss how we can make it happen for you. Or call 631-563-0088 to speak to an experienced Design Engineer about your upcoming project.